If you are what you eat, and the adult is the product of the child’s memory, then yes, I’m about 5,000 miles too far west for my own good. Packed lunches at school rarely involved sandwiches – instead there were ramen noodles imported from Japan (just add hot water from the teachers’ lounge) and maki rolls in delicate urushi-lacquered bento boxes way before Yo! Sushi spread sushi to the masses. Until I left home at 18, I had never had a meal without rice and my first piece of university-era kitchen equipment was a rice-cooker from London’s much-missed Asian-mecca Oriental City (post-closure, the site of the apocalypse in BBC3’s drama The Fades), complete with indecipherable kanji text. When my grandmother left Japan, she and my grandfather brought with them their Japanese chef and each day for thirty years he would produce a decadently simple collection of simmered, fried and grilled dishes which would not be out of place at a Kyoto keiseki feast. But by far my favourite of his creations was a far more humble dish – and I’m embarrassed to admit this – his take on probably the ultimate Japanese comfort food: the improbably awesomely named omu-rice. God only knows where this sacrilegious dish comes from: whoever thought it a good idea to wrap an omelette around ketchup-drenched chicken and rice deserves either a Nobel prize or a trip to the gallows. But as nostalgia food, food to make me feel better, to temporarily fill the void that aches, it succeeds far better than any two tubs of Haagen-Dazs ever could. There’s only one problem: Wife. Last night I brought omu-rice to the sand dunes of the Med. I spent about two hours too long in its preparation and I even embellished her rubbery yellow egg with a gloopy, blood-red ketchup smiley face. That didn’t help: it was met by a stoney-faced, disgusted silence. Not the first time, I might add. But I don’t care. Omu-rice reminds me of Hana-mata-san and his long knives and kindly smile. Of pulling up a wooden stool in my grandparents’ kitchen as the adults went about their intrigues in other rooms. Of being a fat kid who spent too much time on his own. Of a time when my family was much larger and I still believed some of them were good people. When the generations we’ve lost were still alive. When the world was complicated but it didn’t yet hurt. Of being young and stupid and easily comforted. And I will never apologise for that. Sorry. Beautiful words! 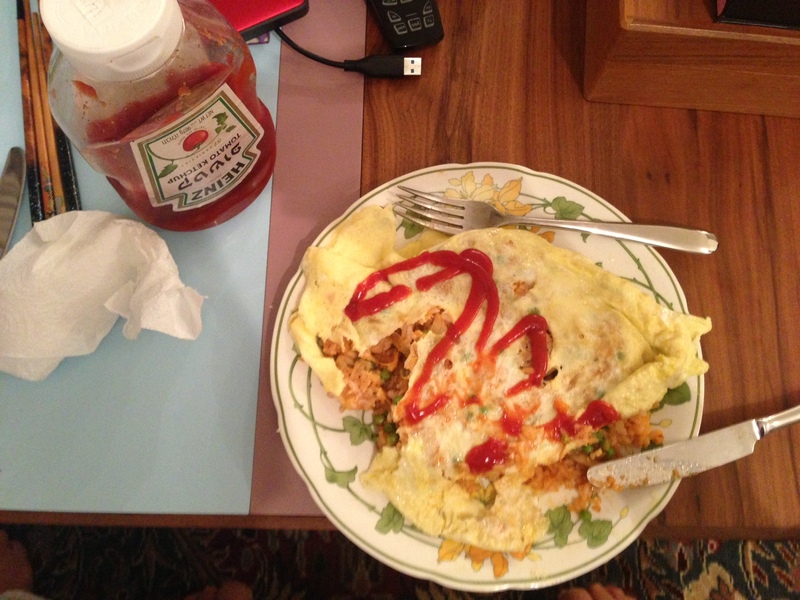 Actually without the ketchup, Omu-rice sounds good to me. This is quite a good recipe if you want to try (maybe substitute fresh tomatoes for the ketchup).